Nybbas is a demon of hell who manages visions and dreams. He may be associated with the Assyrian and Babylonian god of writing, Nabu. Nybbas is an obscure demon mentioned in Collin de Plancy’s Dictionnaire Infernal (1863). 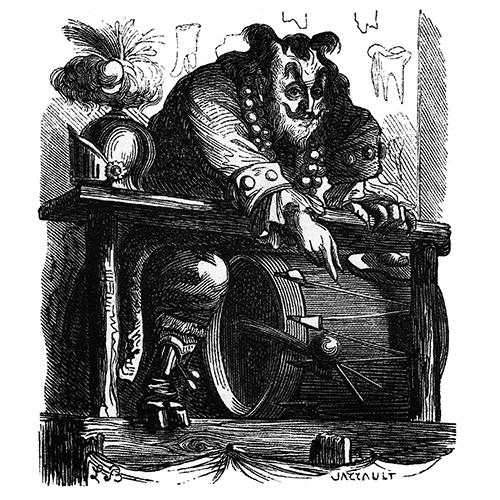 According to de Plancy, the demon is in the high upper gallery of hell, but is regarded as a buffoon and charlatan. He is said to manage visions and dreams. 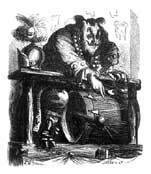 The accompanying illustration shows a humanoid figure with horns and cloven feet sitting behind a wooden desk. He is dressed in royal attire with an elaborate coat adorned with gems on its cuffs and wears a beaded necklace. A knight’s helmet sits beside him. Though I’ve tried to find more extensive references to this demon, I haven’t found anything bearing his exact name. However, the name Nybbas seems very similar to “Nibhaz” (aka “Nebahaz”) mentioned in 2 Kings 17:31. According to the Dictionary of Deities and Demons in the Bible, not much is known about Nibhaz other than perhaps the Avvites erected an image of him in Samaria. French Benedictine monk, Antoine Augustin Calmet, describes Nebahaz’s idol as the figure of a dog in his Dictionnaire … de la Bible (1846). Wikipedia claims that Calmet equates Nebahaz with Nabu in this edition. It’s not in the short passage of text linked above (in French, search for “Nebahaz”), but it’s possible he does so in a different edition. However, Christian Theologian George Rawlinson (1812 – 1902), in his book The Five Great Monarchies of the Ancient Eastern World, does point out in his footnotes that in versions of 2 Kings 31, “The Jews seem often to have played with the names of the heathen gods in a spirit of scorn and contumely… Nebo becomes in one place Nibhaz, ‘the barker,'” so perhaps there is an association between Nebo and Nibhaz. Nebo is an alternative name for the Assyrian and Babylonian god of writing, Nabu. According to the Dictionary of Deities and Demons in the Bible, Nabu, son of Marduk, became a well-known deity in Akkadian culture. His name, which derives from the base word meaning “to call” or possibly “herald,” became a common element of Babylonian personal names (e.g. Nebuchadrezzar) and was invoked in personal greetings. Nabu is not mentioned in association with the 50 names of Marduk in the Enuma Elish, the Babylonian creation myth, nor have hymns survived detailing his accomplishments and activities. Rather, it appears Nabu assumed Marduk’s stature as religious beliefs developed. He is initially described as “scribe of Esagila,” which is Marduk’s temple in Babylon, as well as “chief priest of rites” and “lord of wisdom,” and his symbols were a stylus, wedge, tablet and writing board. By the 14th-11th centuries BCE, he is described as one “who fixes destinies” and his popularity reached its summit with the rise of Neo-Assyrian power (ca. 925 BCE) when a number of temples were dedicated to him in chief cities. One engraving states “Trust in Nabu: do not trust in any other god.” Libraries would often ask Nabu for protection – and to curse anyone who stole from them. A popular Babylonian New Year Festival had Nabu traveling to Babylon to meet Marduk. They would settle the fate of the land for the upcoming year, which Nabu would then inscribe on his tablet. One prayer found calls this a “tablet of life,” similar to the book in which God recorded the names of those who pleased him (Exod 32:32-33; Pss 69:28; 139:16) The Hebrew Bible mentions this festival in Isaiah 46:1, though here, the gods are not worshiped by devotees, but are associated with beasts of burden. In Greek culture, Nabu was linked with Apollo, and his astrological planet was Mercury. He is also associated with the Sumerian god Muati. His consort was Tashmetu/Tashmetum, sometimes named Nanaya. Nabu’s popularity gradually declined during the first millennium CE, with the Mandaeans describing him as both a god of wisdom and writing – and a false Messiah.